No breakdown was suffered, but a recent holiday that included plenty of miles of desert riding in Utah saw us taking a road in the Paiute Trails area that had a good six inches of fine baby powder-like dust that was unavoidable. It was like driving in graphite powder. I have long hated the engine air intake location where it's plumbed all the way up to that grill between the seats but is NOT CONNECTED there, and it draws its air from the back tire compartment. You can try to avoid your co- ORV travelers dust but there's not a damned thing you can do about it inhaling your own dust kicked up from your own tires and this road was just awful with the stuff. When I got back that evening the air filter of course looked like hell. It made me worry whether the machine was going to survive the trip. 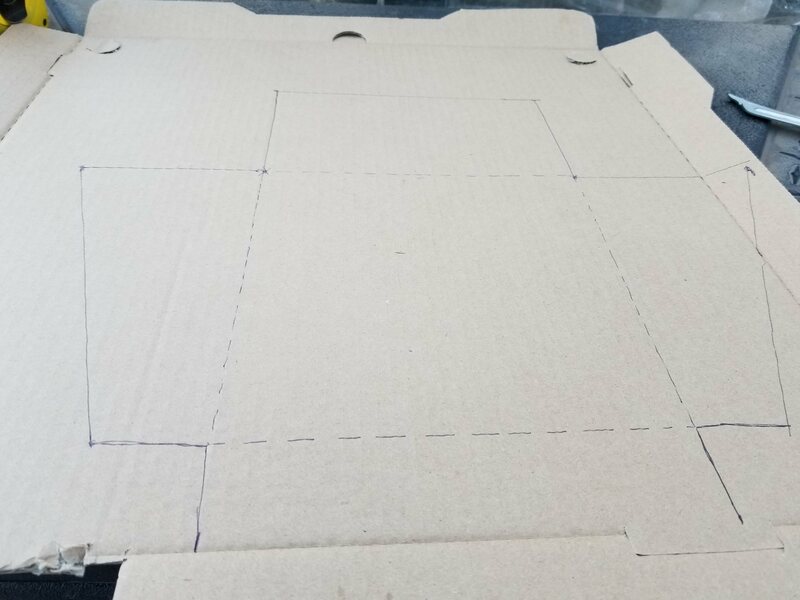 I set to work with a pizza box and some duct tape and I made a baffle to section off most of the intake grill so that it had to draw its combustion air from the intake grill alone, which I have long suspected was the design intent by the engineers of the 800's platform and not followed for some reason or other. Cut solid lines and fold at dotted lines. Closing off the bottom part was more awkward but it was done and the result was a setup where the intake was getting what had to be almost all it's air from inside the cab, where the air was much cleaner of dust and where I had a measure of control over it. The lower end of the diverter interleaved my new air box with another flap on the grill cover, as good a closure as I could manage in the circumstance. I don't have an after pic of the refined intake's effect on the filter, but it was way cleaner after several days riding than the first time after just one day's ride. Makes a guy wonder and I'm not trying to toot my horn when I say this, but how on Earth is it that a hillbilly with a pizza box and some duct tape is able to make a dramatic improvement in the 800's intake system, that CF Moto with it's big factories and design engineers doesn't make? Why? ps. 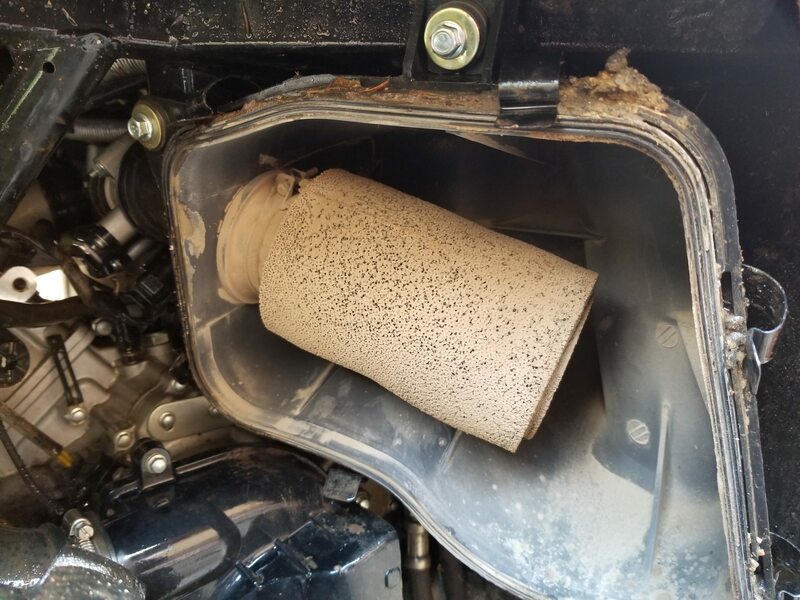 there was no noticeable increase in intake noise so that wouldn't have been the reason CF Moto made the air intake not connect. Nice...lol. Yeah...makes you wonder...and wonder about the fact that they still haven't done anything with that in all these years. Couldn't agree more. What does Polaris do for their intakes on the RZR? I'm not sure now. Need to take a look at someones. Jason did a video on a filter he was using on his...I'll take a look and see if he still has it.... Well still has them. Here's one. Looks like they get their air from the back on the side...and if you look on the first one, you can see his butterfly in the TB is crusty around the edges...not good. I know several polaris owners who lost their engines from dust ingestion also so...it's not just a CFM issue.